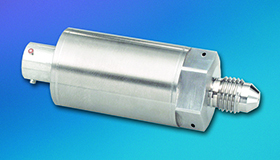 The BME-76I-1100 digitally corrected transmitter offers high accuracy with a total error band of ±0.25% FSO, inclusive of all errors over a wide temperature range of -40°F to +250°F. The ingenious application of modern solid state technology to transducer sensing makes the BME-76I-1100 Series the most advanced pressure transducer available. Designed to measure liquid or gas pressure, the transducer is of all-welded stainless steel construction, with integral pressure port and diaphragm.